A new friend joins the party! A new friend joins the party! 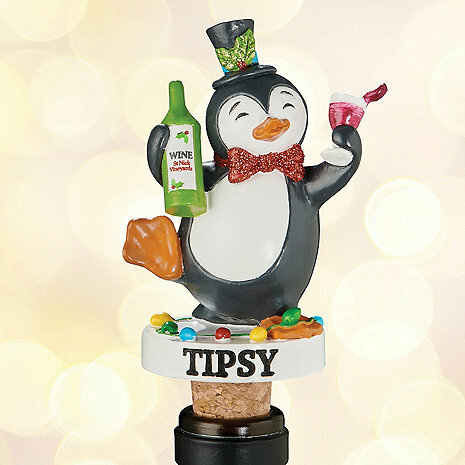 Tipsy the party penguin is dressed and ready to celebrate the holidays with his top hat, sparkly red bow tie and permanent tuxedo. He makes a great stocking stuffer alone or with his reindeer friends Blitzen, Dancer and Cupid. Loved it. Gave it to a friend for Christmas. She loved it. Would recommend it to friends and family. They are exceptionally cute!!! Gave them as "token" gifts and everyone loves them!!!! Whimsical and fun!!! This is so cute...just makes you smile! Good quality as well. Fun,fun,fun. Great all guest loved little Tipsy would recommend to all?? I liked the product from the catalog, but the person receiving this gift never got it.